Panasonic's close relationship with end users and the resale industries has enabled development of specialized turnkey video-wall solutions that exceed the demands of professionals by streamlining installation, safeguarding reliability, and enhancing performance around the clock. Serving high-impact images, the VF1H Series assure high visibility and ease of operation unrivalled by any other brand. Narrow frames on Panasonic's LCD Video Wall Series reduce bezel-to-bezel distance to a near-invisible 1.8 mm* (0.07"). Even when viewed close-up, screen borders are almost indiscernible, resulting in truly spectacular large-format images. * Bezel-to-bezel distance refers to the combined top and bottom (or left and right) bezel-width of adjacent displays in video-wall configuration. The gap between displays is not included. Note that a gap of 0.5 mm (0.02") or more is required when installing multiple displays. Panasonic IPS panel preserves true color accuracy for a wider proportion of the specified 178-degree viewing angle than conventional VA panels. Note: Graphic is simulated. Visibility depends on environment. * Part number suffix may differ depending on the license type. Note that some potential device failures cannot be predicted. Combines AV and Control Signals Save time and money with Panasonic's simplified DIGITAL LINK connection. 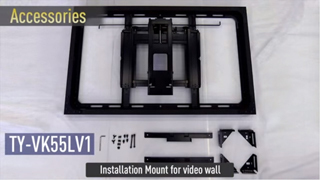 Optional Installation Mount* makes setting up a spectacular video wall comparatively quick and painless. As well as saving time and reducing labor cost, the rigid mount also eliminates potential panel-surface alignment inconsistencies with the use of an automatic magnet system. Inconsistencies in the video wall display can occur when individual panel bezels are not correctly aligned vertically and horizontally, and when panel surfaces are not properly adjusted. Surface alignment control magnets and interlocking mounts ensure precision installation in every axis. Panasonic's free Video Wall Manager software can be used with LCD Video Wall Series displays. With this software, you can calibrate display color using a color sensor, adjust display settings, and control and manage data via PC. If software is upgraded with an optional TY-VUK10 Auto Display Adjustment Upgrade Kit, brightness and color among multiple displays can be automatically calibrated using a compatible camera (Nikon D5200/D5300/D5500/D5600)*. The VF1H Series incorporates Long Life Mode and a new Brightness Adjustment Function. In Long Life Mode, backlight brightness is optimized to extend product life. Auto Brightness Adjustment Function corrects light output automatically according to the rate of backlight deterioration to maintain constant brightness for longer. Note: Assuming operating conditions of 25 °C (± 2 °C). Environmental conditions and conditions of usage may affect brightness longevity and operating period. "On2" delivers approximately 60 % maximum specified backlight brightness. Auto Brightness Adjustment cannot be turned on if panel illumination period has exceeded 1,000 hours. Note: Images and graphs are simulated. Digital signal inputs comprise one or two DVI-D terminals together with HDMI, DisplayPort, DIGITAL LINK, and USB inputs. If the primary audio-video signal is interrupted, the display immediately switches to an alternative input. When the primary signal is recovered during backup display, the original image is restored automatically. This makes the Panasonic LCD Video Wall Series ideal for use in control rooms and in other applications where uninterrupted playback is essential. Note: Possible combinations of main/backup input signals are limited. For details, please see the User's manual. When high-speed video is played on multiple screens in a video wall, some image misalignment can occur between vertically adjacent panels. VF1H Series feature a Reverse Scan Function that alternates the scanning direction of vertically adjacent displays to improve image alignment. Frame Control Function, meanwhile, adjusts the number of video frames displayed to reproduce images with natural fluidity. Reverses direction of image scanning to smoothly play enlarged video on multiple screens. Note: Graphic is simulated. Arrows show scanning direction during video playback. 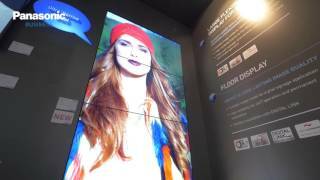 The Panasonic LCD Video Wall Series is adapted to digital signage—just connect USB memory devices to inputs on each display in 2 x 2 multi-screen configuration for automatically synchronized 4K (4 x 1080p) images. No external devices or processors are required. This function also serves as a backup in case the primary video source fails. Multi Monitoring & Control Software allows media to be written to USB memory via LAN, perfect in situations where the display is difficult to access. Note: Local Dimming on VF1H Series is always set. * Up to 2 x 2 zoom is available with media input via USB for VF1H. Note: A mounting bracket compliant with VESA standards is required for wall-mounting. Some degradation occurs when images are enlarged. Be sure to provide adequate ventilation as operating temperatures can vary according to multi-screen configuration and environment.